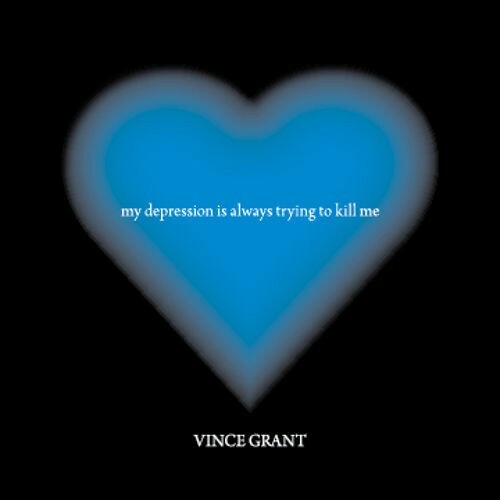 The title of Vince Grant’s recent EP pretty much gives the game away as to what the album contains, the story of an earnest singer songwriter trying not merely to make his self-admitted malady the basis of a transcendent art, but also, more crucially, critically, desperately, to actually deal with a condition that continues to bedevil him. Depression-as-subject matter is a slippery slope in any event, an easily romanticized condition that the less aware among readers, listeners and lovers of theater and film consider a prerequisite to be an artist worth considering.This is an idiotic presumption to start with, but it’s one that’s filtered through our culture for centuries, even in the critical discussions that are ostensible intended to uncover , through, close readings , how a poem, a novel, a play works as art; the thinking , however, has largely focused on what issues the poet has, on the depth of his or her depression , and how the perennial melancholy inspired reams of beautiful down cast poems and lyrics. It was for the longest while that one couldn’t read a biography or critical essay on the works of confessional poets along the lines of Sylvia Plath , John Berryman, or Robert Lowell without the obsession with their depression outweighing the merits of the works as writing: while one couldn’t rightly exclude a mental disorder in regards to discussing what informed a writer’s tone and world view, the consensus seemed to be that such an artist, confessing details of a life that is slipping increasingly into grey areas that are harder to emerge from as time goes by, achieves success only if they perish , commit suicide, due to the increasingly isolation depression places them in. This is morbid thinking and a form of self fulfilling prophecy that sees the artist less as someone creating art than as a victim vainly thrashing about with words and motion as a means to cure themselves of that which curses them daily. Vince Grant , a seasoned singer-songwriter who has long contended with depression , doesn’t entertain the notion that he will eventually conquer , transcend or “cure” himself of his depression with his music. In his publicity materials for My Depression is Always Trying to Kill Me, he’s quoted as saying “…I write songs to cope. I’d like to say I write songs to heal, but that may be asking too much.” Any alcoholic and addict who’s down a “fearless and thorough inventory” of themselves with the aim of finding a means to deal with a damning condition they’re powerless over, Grant , in his music , understands not just the bed rock permanence of depression the emotionally crushing , seldom relenting feeling of feeling that an invisible but none the less impenetrable wall surrounds him, separating him from the world, but that dealing with it is something the sufferer does one day at a time. The album is a story of sensations, the cold gloom at the bottom of the dark hole he finds himself, the recalling of dreams, lovers, friends, opportunities taken from him from him by his depression and his attempts at self-medicating with booze and drugs, the attempt to rise from the mire and move toward the sunlight, to re-enter the world of sound and motion, to become part of the great parade of in the life he has, to be a citizen, just for today. It’s one step forward, another step, forward, a step back, a stumble, a rising after the fall, a step forward, another step , one day at time. One can be cynical about the simplicity of a philosophy that is likely culled from twelve step programs, but what we have with Grant’s songs is a pervasive honesty that doesn’t add the element of “the Hollywood Ending” that assures the listener that hope wins over all; that would be dishonest to Grant’s truth. He does not deny the pain his condition creates for him, he remembers vividly that what he copes with is still present and can take him out if he grows lax in his efforts to keep himself about the waves that threaten to overcome him. The paradox of this review is that Grant’s honesty and unpretentious testimonial about his struggles and small victories is an effort that impresses and inspires me to great degree; I cannot say, though, that I enjoyed the songs as much I wanted to. Coached in the anthemic style of U2, REM, and Manic Street Preachers and Counting Crows, Grant’s material,musically, is more a collection of borrowed gestures , lacking a distinguishing sound of his. For songcraft , he repeats the worst habit of early U2, which was to dispense with ingenious hooks and the niceties of beginnings, middles and ends and instead rely on layering three or four chord guitar strums with little discernible movement ; acoustic guitar, a persistent bass figure, the addition of a brash electric guitar, additional percussion, the music in volume, diminishing in volume, the volume rising again, a chorus repeated until the whole arrangement, such as it is, fades. Grant’s earnestness comes through, his ragged vocals conveys the humanity of his struggle against the darkness thata follows him,but that is not enough to make up for the feeling of things borrowed without that crucial spark of reinventing the riffs that have influenced him.